We just got back from McCall where we had a great time! Our friends Ron & Kristen came with their kids Kian & Marie. 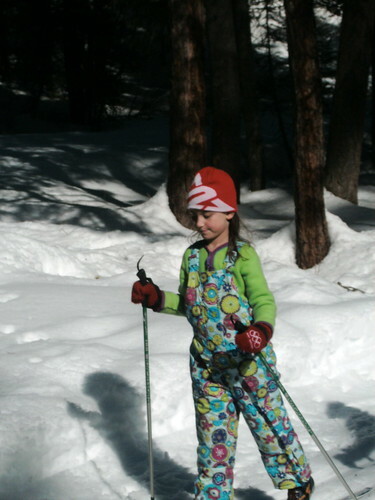 We went Skiing, Snowshoeing, Hot Chocolate, and had a great evening at the Blue Moon Yurt. Wahoo! So, tomorrow is Valentine's Day, the day after that is President's Day, and the day after that, Lisa, Louise & I fly to Idaho to spend a few nights in McCall! We're looking forward to seeing some of that snow that the rest of the country is getting. Here in Seattle, we've got the same weather you've seen on TV at the Olympics - it was one of the warmest January on record - so it's been too warm for snow in town, and barely warm enough for skiing in the mountains. Luckily, we signed up Louise for ski lessons at higher altitude Crystal rather than closer, lower-altitude Snoqualmie Pass, so we've got some good skiing in. Apropos of nothing (could be the sub-title of this blog), this short film below has been online for a while - I finally got around to watching it, enjoyed it, and figured I'd post it. MILTON GLASER DRAWS & LECTURES from C. Coy on Vimeo. This is a Flickr badge showing public photos from knlranch tagged with louise. Make your own badge here.